New to the forum and very much looking forward to meeting everyone. 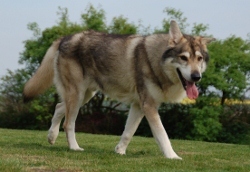 I live in New York and have a ten year old Tamaskan named Lupo. He is my shadow and best friend and I can hardly put into words, just how much joy this animal has brought me throughout our past ten years together. He is a very healthy and happy boy and loves to swim and chase deer off the property. I am looking to bring home a new addition to the pack in the near future and know that I have come to the right place. Welcome Joe to our forum and hope you find it interesting. What is your boy's breeding? Lupo was one of the last litters from Double J Kennels in New York. He was born in 2008.